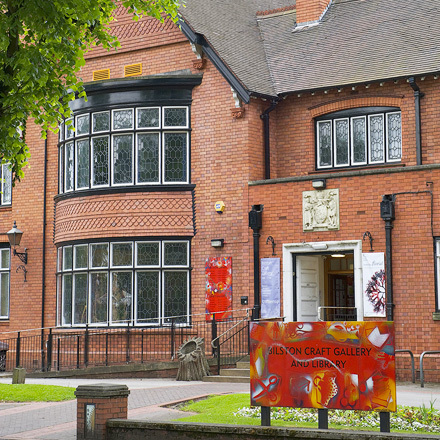 ​Bilston Craft Gallery occupies a locally listed historic venue in tree-lined Mount Pleasant. Built by Frederick Harper as a fashionable Victorian villa for his family on the site of Brueton House in 1905, the Harpers – like the Bruetons – were local lock makers. By 1918 the premises were occupied by Bilston Girls’ High School, until they moved to a purpose-built school in 1930. Bilston Borough Council then conceived the idea of opening a municipal art gallery and museum on the site, bringing it together with the public library, which was housed in the Town Hall. This plan received a boost in 1937 when Mr William Thompson, originally from Bilston, though then settled in Colwyn Bay, North Wales, donated £1,000 and a collection of around 100 paintings to the new gallery. The combined Gallery and Library opened the same year, and continue to share the premises today. In 1999 Bilston Art Gallery and Museum became Bilston Craft Gallery to bring the best of contemporary craft to the West Midlands, and explore the rich heritage of skilled industrial design and production in the region.